AUSTIN, TX (May 14, 2018): Catalyst, an Austin-based agency specializing in marketing for student and multifamily housing, announced that S2 Capital, LLC/S2 Residential has awarded the agency a contract to oversee reputation management and search engine optimization (SEO) services for their portfolio, which encompasses 13,000 units among 30 student and multifamily properties throughout Texas and Florida. In addition, Catalyst’s contract with S2 Capital, LLC/S2 Residential includes website development and hosting for two recently acquired properties. Catalyst currently manages the reputation for more than 80 properties across six portfolios nationwide and handles corporate reputation, as well. Through individually focused outreach campaigns and personalized responses, the reputation team ensures each property’s ORA™ (Online Reputation Assessment) score is constantly monitored and always improving. S2 Residential is under the parent company of S2 Capital, LLC, a multifamily investment platform specializing in value-added properties, which has acquired more than $1.7 billion in B and C multifamily communities, and successfully invested over $170 million in upgrades and renovations. “S2 Residential is excited about teaming up with Catalyst to oversee our portfolio’s reputation and SEO management as it will give us critical insight into how we can improve upon how we operate to match the needs and expectations of our current and future residents,” said Michele Flores, Chief Operating Officer of S2 Capital, LLC. 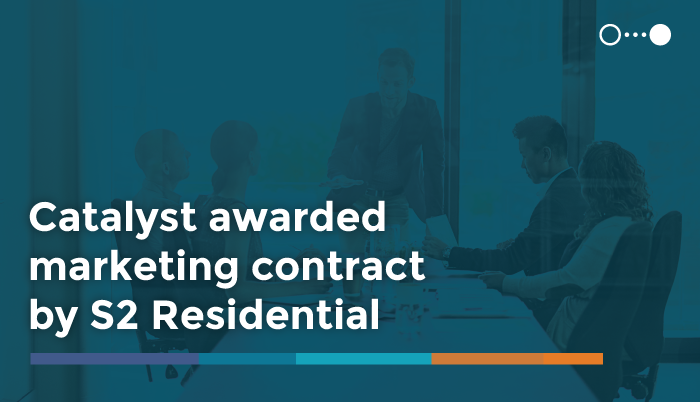 Catalyst is an award-winning, full-service digital marketing and communications agency specializing in student and multifamily housing, commercial real estate, residential real estate developments, and retirement communities. The Austin-based agency’s data-driven approach generates measurable results, and its clients therefore benefit from the highest returning resident ratio in their respective industries. Catalyst’s in-house team provides its clients with integrated brand, marketing, design, and public relations services, leveraging the latest technology advances and millennial communications strategies. Visit https://thelyst.com to learn more. S2 Residential provides property management services for 30 properties within its parent company portfolio, S2 Capital, which was founded in 2012 to build a national multifamily investment platform specializing in value-added properties. S2 Capital has acquired over $1.7 billion in B and C multifamily communities, and successfully invested over $170 million in upgrades and renovations. S2 Residential currently has a total of more than 13,000 units comprised of one student housing asset in Tyler, Texas, and multiple multifamily properties located throughout Texas and Florida.